Selling your business or acquiring a target company is an extensive and oftentimes overwhelming process. Owners spend years, sometimes decades, building the reputation, foundation and success of their company. When an owner finally is ready to entertain an exit strategy, it is vital that his/her business, financial and personal objectives upon exit are met. On the other hand, acquiring firms and private investors focus on the target company’s operations, financial health and risk profile. In order to accomplish these objectives and meet the oftentimes divergent objectives of the parties, sellers and buyers often utilize pre-transaction due diligence providers to carefully and methodically investigate a target company. In the coming months, Skoda Minotti’s Transaction Services Group will provide valuable information to help potential buyers and sellers understand how financial due diligence can ease the complex deal process and answer the most important transaction-related questions. Each month, we will provide an in-depth look at certain financial due diligence issues, as well as details on other types of diligence work that can help you navigate your transaction. Do you have questions about the due diligence process? 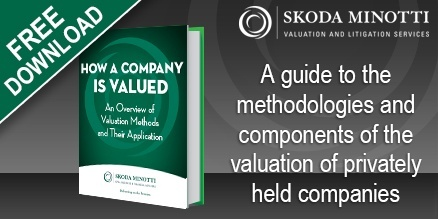 Please contact Patrick Walsh, CPA, MBA, at 440-449-6800 or pwalsh@skodaminotti.com. This entry was posted in Mailchimp RSS, Valuation & Litigation Services and tagged buyer, dealmaker, due diligance, ebitda, seller, valuation, vlue. Bookmark the permalink. Follow any comments here with the RSS feed for this post. Comments are closed, but you can leave a trackback: Trackback URL.